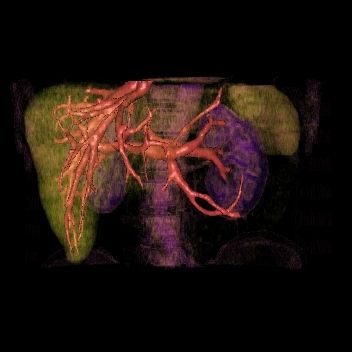 Launched in 2005 as a joint research partnership with APHP - Pitié-Salpêtrière Hospital (Central Radiology Department), the Hepatic View study deals with the automated segmentation of hepatic vessels during various perfusion phases in CT imaging. The derived information is then exploited for computer-assisted pre-operative planning, both for healthy donors and for the ablation of diseased regions. In this context, ARTEMIS has developed a semiautomatic technique for modeling the hepatic vascular network, combining 3D mathematical morphology and multi-criteria Markov Random Fields. Performance assessment is currently ongoing within the framework of a national scale clinical protocol.